On May 7, 1860, the member from Berks County rose on the floor of the United States House of Representatives to announce that in nothing did he more fully represent the people of his district than in his uncompromising hostility to the corruption and infamy of the administration of James Buchanan. The administration had tried to bribe him with its power, he said, but he would continue to serve the people, if his predecessor had been the right-hand man of the President, he would be the right-hand man of the people, the President’s masters. Thus John Schwartz, ironmaster, veteran of 1812, nominal Democrat and representative from the stoutest Democratic stronghold in Pennsylvania, keynoted the bitterness of the election year of 1860. By national election day on November 6, party loyalties would be torn as perhaps never before, the Democratic party would split squarely in two, and for the first time since 1848 the opposition would send its candidate to the White House. In Berks County, Abraham Lincoln would break the decades-long Democratic hold on the city of Reading in presidential elections, but would lose the county not to the Northern Democrat, Stephen A. Douglas, but to John C. Breckinridge, the candidate of the South. Election excitement in Berks began early in 1860. On February 27, delegates began arriving in Reading for the Democratic state convention, crowding the hotels and seeking out rooms in private houses. To Barto’s Hotel went the most prominent candidates for the gubernatorial nomination, Witte and Fry, and in the lobby there the managers gathered to trade off votes and make their promises of patronage. That all was not harmony in the Democratic ranks was already apparent. Since 1857 Stephen Douglas, the Little Giant from Illinois, had stood in arms against President Buchanan and the Southern plantation owners who were the real rulers of the national administration. By supporting the Lecompton constitution in Kansas, the administration had sought to make a mockery of Douglas’s doctrine of popular sovereignty, and on popular sovereignty Douglas would stand or fall. Buchanan had a firm hold on the machinery of the party in his home state of Pennsylvania, but there would be Douglas men at the Reading convention and their discontent might threaten a serious breach. The Democratic papers of Reading called on the convention above all to maintain a solid Democratic front. To unite the party is the first duty of the convention, said J. Lawrence Getz’s Reading Gazette & Democrat. Few Pennsylvania party conventions have been so important as this one, proclaimed the Readinger Adler, on its proceedings depends the success not only of the Democracy in Pennsylvania but of the party in the race for the Presidency. For the moment the cracks in Democratic ranks were healed over. While the proceedings of the convention may not have been marked by quite the unanimity and joyfulness which the Gazette & Democrat claimed for them, there appears to have been general satisfaction regarding the choice of Henry D. Foster of Westmoreland County as candidate for governor. Even the opposition Berks and Schuylkill Journal noted the enthusiasm of the Democrats following the nomination as they fired cannon and paraded through the streets. On the evening of March 1, last day of the convention, the Democrats of Berks gathered in a mass meeting at the Court House to ratify the proceedings of the convention and hear Foster’s letter of acceptance, while the U. S. Cornet Band, accompanying the Keystone Club of Philadelphia, furnished martial music. Meanwhile the opposition had held its own state convention at Harrisburg. Throughout the nation the Republicans were emerging from the ruins of the Whig party as the principal rivals of the Democracy, but that the new opposition party had not yet firmly jelled is evidenced by the widespread use in Pennsylvania, and especially in Berks, of the name People’s party by the Republicans. William W. Baird headed the Berks delegation to Harrisburg. The gubernatorial candidate turned out to be Andrew Gregg Curtin of Centre County, Simon Cameron, known to Reading voters not only as U. S. Senator from Pennsylvania but as president of the Lebanon Valley Railroad, was named as the choice of the state organization for the national presidency. The Journal’s full enthusiasm was reserved for other candidates. Prominent in its columns was the name of Edward Bates, the Whig patriarch of Missouri. From the New York Times was copied a favorable description of Bates by a St. Louis correspondent, from the Crawford Journal was taken a sketch of Bates’s life. In March the Journal printed a statement of principles made by Bates in a letter to Republicans of Missouri, asserting in its editorial columns that Bates’s position should be satisfactory to every opponent of the Democratic party and would eventually become the policy of the nation. John McLean of Ohio, a dark horse whose name is little remembered today, also received much favorable notice. The Journal called attention to the belief of some that McLean could best consolidate the strength of the opposition and render Democratic defeat a certainty. It stated that without a doubt the Republicans could have won in 1856 if McLean had been their candidate. The only plausible objection to McLean, thought the Journal, was his advanced age, and this could well be ignored since he was still in full vigor. It may be regarded as a testimony to the political acumen of the editors of the Journal, however, that from the outset the real favorite of the paper for the 1860 presidential nomination of the Republican party was Abraham Lincoln of Illinois. Until his Cooper Union speech of February 27, 1860, Lincoln was, as the New York Times put it, to most easterners simply an Illinois lawyer of some local reputation. Yet the Journal mentioned Lincoln as an excellent presidential possibility as early as December, 1858, and again in November, 1859. It was probably the latter article which reached the attention of Lincoln himself and much gratified him. The Journal’s hopes for a Lincoln nomination were not denied by the Republican national convention which met at the Chicago Wigwam in mid-May. Berks delegates attending the convention were Isaac Eckert, David E. Stout, J. Knabb, and J. Bowman, most of the Pennsylvania delegation voted for Cameron on the first ballot, then switched to Lincoln on the second to turn the tide of the convention and make possible Lincoln’s nomination on the third ballot. The Berks and Schuylkill Journal greeted the news with enthusiasm, stating that no stronger nomination could have been made. Lincoln, the paper said, was the right man for the times, the candidate who above all others could arouse popular enthusiasm and ensure Republican success. His ability, his patriotism, his sense of justice, his acquaintance with the wants of the people would make Lincoln a president not of some political faction but genuinely of the people. The Republican platform, opposing the extension of slavery, condemning the whole political and financial policy of the Buchanan administration, and favoring a protective tariff, was declared as sound as the candidate. 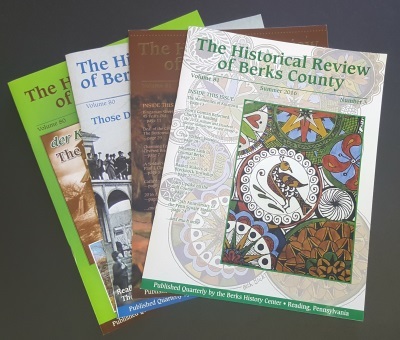 Nor was the Journal alone among Berks Republicans in its enthusiasm, Lincoln’s Berks ancestry and the fact that a branch of his family still lived in the county added to his local popularity, and his nomination was greeted in Reading by the firing of a hundred guns. The local Democratic press did not, of course, share Republican feelings in regard to Lincoln. Until this time they had given the Illinoisian little notice, now the Adler remarked that Lincoln was one of the weakest candidates the “Black Republicans” could have chosen, and the Gazette & Democrat inaugurated a series of scurrilous articles recalling that Lincoln as a Congressman had opposed the Mexican War, insinuating that his conduct during the war had been next to traitorous, and proclaiming in headlines that soldiers of the Mexican War could not vote for him. Democratic cries against Lincoln were no doubt made louder by the feeling of desperation which must have pervaded the party after catastrophe overtook its own national convention. The Democrats met at Charleston, South Carolina, late in April. Again the Reading Gazette & Democrat prefaced the convention with an editorial calling for harmony within the party. The Gazette & Democrat stated that Breckinridge would probably be the first choice of Pennsylvania for the presidency, doubtless projecting its own feelings as an administration organ, but added that if the party but remained true to itself, the people would be true to the party and elect anyone nominated, be he Hunter, or Lane, or Guthrie, or Dickinson, or even Douglas. The Reading convention was not, however, reenacted on a national scale. The Southern fire-eaters united on eternal hostility to Douglas and a demand for a territorial slave code, Douglas would abandon neither the doctrine of popular sovereignty nor his fight for the presidential nomination, believing that despite the opposition of the administration he was the true choice of the nation’s Democrats. Douglas indeed had a majority of the delegates and could write the party platform, but he lacked the two thirds vote required for nomination, and when the platform was adopted, the Southern delegations began to walk out. Nonetheless, initial gaiety on the Keystone State soon gave way to seasickness, and the delegates arrived at Charleston in a gloomy frame of mind well suited to the events there awaiting them. Frederick Lauer’s fame at the convention was not gained only by his lager beer, the West Chester Jeffersonian carried a rousing, spread-eagle speech made by Lauer in committee, defending the orthodoxy of the Democrats of Old Berks. The object of the Berks Democracy, said Lauer, was to make peace, union, and harmony. The people of Berks would have nothing to do with abolitionists, they had been misled once by the Stephen Douglas-John Schwartz faction and its abolition friends, but never again would they be contaminated by Black Republicanism or squatter sovereignty. The Union was in danger, and for the sake of the Union the Democratic party must be kept pure. If the South asked guarantees, she must have them, she was entitled to safeguards when fanatics like John Brown were arrayed against her, Old Berks and Pennsylvania would see that she got justice. Our emissaries abroad reported that among Europeans it was widely believed that the Union was about to be broken, the Democratic party, guided by God Almighty, must stand by the South, drive the fanatics from Democratic ranks, and save the country. When news of the Democratic schism at Charleston reached Berks, the Journal jubilantly appeared in mock mourning guise, with its obituary for the departed Democracy outlined in black. The Gazette & Democrat claimed optimism in spite of the apparent disaster, editor Getz believed that temporary suspension of the national convention would give the Democrats time to arrange a satisfactory compromise. The party met again at Baltimore in June, but the outcome of the new convention was even worse from the Democratic viewpoint than that of Charleston. The Democracy now fell victim to a definite rupture, with the Northern wing nominating Douglas and standing for popular sovereignty, and the Southerners bolting to nominate John C. Breckinridge of Kentucky. Again Clymer and Lauer were the Berks delegates. Both of them, along with the majority of the Pennsylvania delegation, which was still under the thumb of Buchanan, voted to recommend readmission to the convention of those delegates who had seceded at Charleston. Before voting for the presidential nomination began, Lauer was called home on business and appointed Berks promontory David Fister as his substitute. On the first ballot, both Clymer and Fister voted for James Guthrie of Kentucky, who had been a member of Franklin Pierce’s cabinet. On the second ballot, Clymer remained with Guthrie, but Fister turned to Breckinridge. When finally Stephen Douglas was nominated, Fister left the convention to join the Breckinridge gathering, Clymer remained but took no further part in the proceedings. The Breckinridge ticket was chiefly the instrument of the Southern fire-eaters, who were willing to destroy the Union rather than compromise an inch on the extension of slavery, but it was also the heir of the Buchanan administration, and it received wide support in Pennsylvania and Berks, including that of the Reading Gazette & Democrat and the Adler. The Gazette & Democrat expressed hope and belief that the Democratic schism would prove temporary and argued that if the decision must lie between Breckinridge and Douglas, then the Breckinridge slate was the more national and conservative of the two. Meanwhile the Berks and Schuylkill Journal crowed its belief that the local Democracy was split straight down the middle. The opinion of the Journal may have reflected over-zealous partisanship, but the Democratic situation was hardly a pleasant one. The Gazette & Democrat professed to believe that a large majority of Berks Democrats went along with it for Breckinridge, but news of Douglas’s nomination was followed by a hundred-gun salute in Reading, and the Douglas men in local Democratic ranks were to prove troublesome. State Democratic leaders hoped to salvage the ticket of the Reading convention from the ruin of the national organization. Moreover, the state leaders were chiefly Breckinridge men, and they feared that in an open contest between Breckinridge and Douglas, Pennsylvania Democrats were likely to go for the Little Giant. Accordingly, the Democratic State Central Committee suggested a Democratic “fusion” ticket, a plan by which Democratic voters would in November choose electors committed neither to Breckinridge nor Douglas but free to vote for any candidate who could defeat Lincoln, whose downfall was after all more important to the party than the question of which particular Democrat should sit in the White House. A minority of Douglas supporters throughout the state refused to follow the policy of the state committee, however, and led by John W. Forney, editor of the Philadelphia Press, they supported a ticket of all-Douglas electors. On July lithe Democratic City Club of Reading gathered at Barto’s Hotel. The meeting was preceded by a street parade in which was carried a transparency bearing, as the Journal observed, the rather curious announcement that the group intended to ratify the State Central Committee. What was meant, of course, was that the meeting had been called to endorse the fusion idea. Difficulty arose when, after one Jeremiah Hagenman had put forward pro-Breckinridge resolutions, Albert D. Green proposed counter-resolutions favoring Douglas. The Hagenman resolutions were adopted by a considerable majority and Green’s proposals were voted down, thereupon Green and a number of followers stalked from the hall, announcing they would form a new Democratic city club. Seeking to make hay of the Democratic squabble, the Journal pictured the whole affair as a piece of high-pressure railroading on the part of the Democratic leaders, when a Douglas man tried to speak, said the Journal, he was silenced by cries of “Music !” which brought a response from the band. TheGazette & Democrat charged, on the other hand, that the real aim of Green and the Douglas men was to aid the opposition, and that editor Getz was not entirely wrong was evidenced by Forney’s later boast that his refusal to support fusion had helped elect Lincoln. Nor were the Breckinridge Democrats inactive. The Gazette & Democrat carried a letter from George M. Keim, local leader whose name appeared on the regular Democratic electoral ticket, announcing that he would support fusion and vote for either Breckinridge or Douglas in preference to Lincoln. As the campaign progressed, mass meetings and celebrations were held throughout the city and county. On the evening of August 11, for example, the Democrats of the North-East Ward erected a 104-foot pole at Ninth and Washington Streets, bearing a flag with the inscription: “For Governor, Henry D. Foster. The Union of the Democratic Party for the sake of the Union”. A meeting at Boyertown on September 29 was claimed to have been the largest Democratic gathering ever held in lower Berks. Headed by the Boyertown Band and over a hundred mounted torchbearers, marchers carried transparencies reading, “A Union of hearts, A Union of hands, The Flag of our Union forever,” “No Rail Splitters, nor Union Splitters,” and “We can split our own Rails, Abe !” Meetings were held in Brecknock, Robeson, Leesport, Molltown. Probably the most active campaigners in the year 1860, however, were the Republicans. Especially did the opposition party emphasize winning the support of the younger voters of Reading and Berks. As early as March a Young Men’s Curtin Club and a Central People’s Club were organized, the Curtin group soon became the Young Men’s Union Club. Shortly after the Lincoln nomination, the young men of Reading were invited to the U. S. Hotel on West Market Square, temporarily designated the Lincoln Wigwam, to form a Wide Awake Club. Nor were Republican activities confined to the city. A Wide Awake club of a hundred members was organized in Birdsboro. A Lincoln, Hamlin, and Curtin club opened a reading room in Hamburg. The Republicans of Robeson, Union, Exeter, and adjoining townships erected a 145-foot pole at the Junction House on the west bank of the Schuylkill, a mile and a half above Birdsboro. Meetings were reported in Morgantown and Leesport. A pole raised in Exeter township was torn down by Democrats but raised again. In the field besides the Breckinridge, Douglas, and Lincoln forces were the followers of the Constitutional Union party, whose presidential standard bearer was John Bell of Tennessee and whose platform was simply adherence to the Constitution and the Union and enforcement of the laws. The party was organized in Pennsylvania at a state convention at Lancaster in April, though no gubernatorial nomination was made. Berks delegates to the national convention in Baltimore were John A. Banks and Captain F. P. Heller. The party was not inactive in Berks, a rally held at the Schmucher House on September 1 was termed by the Gazette & Democrat one of the largest and most spirited of the campaign. The City Cornet Band paraded the streets for the Bell men, followed by transparencies bearing the names of Bell and Everett and broadcasting Henry Clay’s prediction of the foundation of a party such as the Constitutional Unionists. Each party sought to bring outstanding figures from its ranks to Berks as speakers. The most distinguished of the visitors was Stephen A. Douglas, who appeared in Reading on September 8. His welcome, however, though respectable, seems to have been hardly commensurate with his national stature. The admiration of the Democratic Gazette & Democrat for Douglas was grudging and little calculated to secure an enthusiastic turnout for his appearance, Douglas’s campaign, said the paper, had for its object the self-exaltation of the candidate more than the welfare of the party and the country. Douglas was greeted at the Passenger Depot on Saturday morning by the firing of cannon and escorted to the Mansion House, in the afternoon he proceeded to a stand in East Market Square, where he gave an address and was welcomed by William M. Hiester, Secretary of the Commonwealth. Though all the candidates of the Democratic county ticket were invited, none appeared on the platform with Douglas, and all kept themselves out of the way during the entire visit. That night Douglas set out for Pottsville, returning to Reading on Sunday morning to remain until Monday noon. During his stay, his photograph was taken by Daniel Maurer and S. B. Howard. On September 26, while the county fair was in progress, Reading was visited by the Democratic gubernatorial candidate, Henry D. Foster. The visit furnishes an interesting example of the way in which partisanship led the newspaper of the day to report a single event in such utterly different ways that two accounts of it might bear practically no resemblance to each other. The Journal reported that the turnout for Foster’s visit was more meager than that of an ordinary fair day, with no delegations and no enthusiasm, the Gazette & Democrat stated that Foster was greeted with enthusiastic evidences of delight, with Democrats from every township of the county and throughout the city coming to welcome him. The Journal said that when Foster reached Barto’s Hotel, only about fifty persons welcomed him, the Gazette & Democrat claimed that thousands visited the candidate at his hotel. The Journal pictured the torchlight parade held in Foster’s honor as a completely insignificant affair, with only 434 men participating but many boys pressed in, the procession taking but four minutes and thirty seconds to pass a given point, the Gazette & Democrat emphasized that the procession was six squares long, that an immense crowd gathered at the speaker’s stand, and that when the procession reached the stand, the whole of Market Square and the pavements on both sides were jammed with people. Appearing for the Republicans on September 18 was Carl Schurz, who addressed what the Journal claimed was the largest audience ever assembled at an evening political rally in Reading. Speaking in both German and English, Schurz discussed the Homestead Bill, the tariff, and the ever-present question of the extension of slavery. He had recently made a tour of the reputed Democratic stronghold of “Egypt” in southern Illinois, Schurz said, but the immense crowds of Republicans who greeted him there convinced him that the Democratic stronghold existed no more, accordingly, he decided to hunt up Old Berks to see a genuine Democratic redoubt, but the turnout of Republicans convinced him that here too the Democracy had seen better days. The Democrats had indeed lost strength in Berks in recent years. In 1858 the regular Democratic candidate for Congress, J. Glancy Jones, had gone down in defeat before John Schwartz, who ran on an independent Democrat-Republican coalition ticket. Schwartz won by only nineteen votes, but he won nonetheless, and his triumph was the more remarkable because Jones was no ordinary administration candidate but one of President Buchanan’s foremost leaders on the floor of the House. The opposition in the guise of the People’s party also carried the city elections of 1859, electing Benneville Keim mayor of Reading by a margin of 934 votes. The city elections in the spring of 1860 could be looked upon as an indication of what to expect that fall, and here again the People’s party triumphed. Keim was re-elected mayor, and the opposition elected the city treasurer, three auditors, all the members of the Select Council, all but four of the Common Council, the two aldermen, and a majority of the ward officers. Democrats could take comfort, however, from noting that Keim’s majority had been reduced to 135. In rural Berks both parties claimed favorable auguries in the spring elections, with the Journal contending that the opposition carried nearly all the doubtful districts, while the Gazette & Democrat stated that the Democrats had won out in almost every district where a party question was made. Actually, the Democrats still had an imposingly firm hand on rural Berks. The campaigning of the summer of 1860 was pointed really toward two elections. State and county officers would be chosen on October 9, and the presidential contest was scheduled for November 6. The county tickets were chosen at conventions held in late summer. Of these, the Democratic delegate convention, the Journal charged, was nothing more than window dressing, the delegates arrived fully instructed as to whom the few men who operated the party wanted nominated. To demonstrate that the candidates had been chosen in advance of the convention and that an astute observer could learn beforehand their identity, the Journal printed its predictions of the nominees, then after the convention it noted that among candidates for thirteen nominations there had been only two changes from its own forecast, though fifty-one aspirants had been in the field. In spite of the Journal’s criticism of the Democratic convention, however, the People’s party abandoned its plan to have voluntary candidates and adopted the Democratic convention method. On June 20 the Berks opposition was struck by news of the death of John Schwartz. The Congressman had been in poor health for some time, but he had made his mark in Congress nonetheless. The House went into mourning for thirty days, and in an unusual gesture of respect, three eulogies were delivered in the Senate, with Cameron of Pennsylvania Charles Sumner of Massachusetts, and Seward of New York all paying Schwartz tribute. The result of Schwartz’s death was that at the county conventions, nominations had to be made not only for Congressional candidates for the 1861-1863 term but for the unexpired term of Schwartz as well. For the Democrats, who met on August 25, the latter task proved an easy one. Two of three original aspirants withdrew, and Jacob K. McKenty was nominated unanimously for the interim position. For the full term nomination there was a battle between J. Lawrence Getz, editor of the Gazette & Democrat, and Sydenham Ancona. The Ancona men charged Getz with responsibility for the defeat of Jones in 1858, the Getz men blamed Ancona for the loss of a special election the same year. In the end Ancona received the nomination. No statement was made on national issues, so that local involvement in the Breckinridge-Douglas tangle was avoided. The Democratic convention was attended by one of the largest audiences ever assembled for such a meeting in Berks, and the Journal claimed that the People’s convention on September 10 was the largest and most spirited ever held by the Berks opposition. The People’s nominees for Congress were Captain James McKnight for the unexpired term and Levi B. Smith for the full term. As election time approached, both sides charged their opponents with attempts at fraud and corruption. The Journal called on its readers to be on the lookout for Republican ballots being circulated with the name of George M. Keim, the Democratic electoral candidate, pasted over that of Republican James Pollock. The paper called on every reader to challenge voters whose right to cast a ballot was at all in doubt. The Gazette & Democrat spoke of spurious ballots printed to resemble the Democratic ballot but with the names of McKnight and Smith substituted for those of McKenty and Ancona. It charged that a corruption fund of $200,000 had been collected in New England to insure a Republican victory in Pennsylvania. That the politicians were fully capable of shady dealings was being revealed to the nation in 1860 by a Congressional committee inquiring into the use of improper methods by the executive to influence Congress, elections, and the administration of the laws. Chairman of the committee was “Honest John” Covode of Pennsylvania, smarting under an administration charge that he had won his seat through bribery. The investigations were conducted in a thoroughly partisan manner, with the committee’s Republican majority sparing no opportunity to embarrass the administration, but though the committee stacked its cards, Covode saw to it that enough evidence was gathered so that the cards remained stacked. The investigations of the Covode committee reached into Berks County when the group decided to inquire why both the number of votes cast in Berks and the Democratic majority in 1856 had been suspiciously high. In 1856, it was recalled, the Lebanon Valley Railroad was being built through Berks, primarily by Irish immigrant labor. Testimony before the committee indicated that a considerable number of forged naturalization papers had been sent to Reading in blank from Philadelphia by Democratic agents, the papers were then filled out for the Irishmen, perhaps more than a hundred of whom gratefully cast the Democratic ballot. The Journal played up the Covode disclosures for all they were worth, while the Gazettc & Democrat gave them as little notice as possible. For all the work of the Covode committee and all the evenings of Wide Awake demonstrations, the Berks elections turned out to be disappointing to the Republicans. On October 6 the People’s party carried the city of Reading, but Democratic majorities in rural Berks were high enough to put the county as a whole in the Democratic column. Curtin received 2,077 votes in Reading to Foster’s 1,862, but Foster carried the county by 10,318 to 6,833 for a final majority of 3,270. In the race for the unexpired Congressional term Mekenty received 1,540 city votes, 9,595 county votes, MeKuight, 2,382 in the city, 7,482 in the county, so that McKenty’s majority was 1,271. Ancona received 1,841 city votes, 9,993 in the county, Smith’s totals were 2,092 in the city, 7,111 in the county, for a Democratic majority of 2,631. With the Douglas Club of Reading supporting the regular county ticket, the Democrats had avoided a local replica of the national schism in their party during the county elections, but the Berks ballot in November would contain both a slate of fusion electors, generally identified with Breckinridge, and a Douglas slate. Some effort was made to withdraw the Douglas ticket as several of the Douglas men came to realize that their cause was hopeless against the regular Democratic organization. On October 25 the Douglas Club of Reading met to consider abandonment of its slate, when the meeting ended in deadlock with no action taken, the club adjourned to pass for the most part from the political scene. The Republican Journal professed not to be discouraged by the results of the county elections, claiming that many in Berks who had voted against Curtin would be in favor of Lincoln. Nevertheless, Lincoln’s Berks ancestry and all the campaigning of the Republicans were not enough to win for Lincoln the Gibraltar of Democracy. Again the Republicans carried the city only to have the rural vote cost them Berks County. In Reading, Lincoln received 2,019 votes, the fusion ticket, 1,487, Douglas, 73, and Bell, 121. In the county, the fusion ticket led with 8,846 votes to Lincoln’s 6,709, Douglas’s 420, and Bell’s 136. The total fusion majority, then, was 855. This article originally appeared in the July – September 1952 issue of the Historical Review of Berks County.